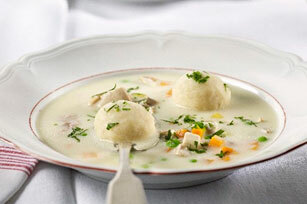 Creamy, subtly spicy and completely delicious, this chicken soup with matzo balls is sure to become a family tradition. Mix first 4 ingredients until blended. Refrigerate 15 min. Meanwhile, heat dressing in medium saucepan on medium-high heat. Add onions; cook and stir 6 to 8 min. or until tender. Stir in broth, chicken, carrots, celery, peppercorns, cloves, bay leaf and pepper. Wet hands and shape matzo dough into 16 (1-inch) balls. Bring soup to boil. Add matzo balls; cover. Simmer 20 min. or until vegetables are tender and matzo balls are cooked through. Meanwhile, whisk cream cheese and flour with 1/4 cup hot broth in medium bowl until smooth. Gradually stir cream cheese mixture into soup until blended; cover and simmer 5 min. Ladle soup into bowls, placing 2 matzo balls in each. Sprinkle with parsley. Serve with fresh fruit and a side salad tossed with your favourite Kraft Dressing to round out the meal.